My interest in ceramics began in high school with a pottery class in 1968. I continued taking pottery and art classes throughout the remainder of high school and into college. After completing two years at Shoreline Community College, and three years at the University of Washington, I graduated in 1975 with my Bachelor’s of Fine Arts degree. Over the years I’ve given many workshops and taught at several schools including the University of Washington, Everett Community College, and presently at Shoreline Community College. My work has been featured in “Ceramics Monthly”, “Clay Times Magazine”, and Robin Hopper’s book, “Making Marks”. I have had many gallery shows, most notably at the Bellevue Art Museum, Smithsonian Institution, and Whatcom Museum of History and Art. My work is also included in national and international collections. I am primarily a functional potter. I work predominately in porcelain, although not from a traditional perspective. My forms are defined by functional simplicity and the white surface of each piece is decorated with abstract designs in blues, browns, and grays. 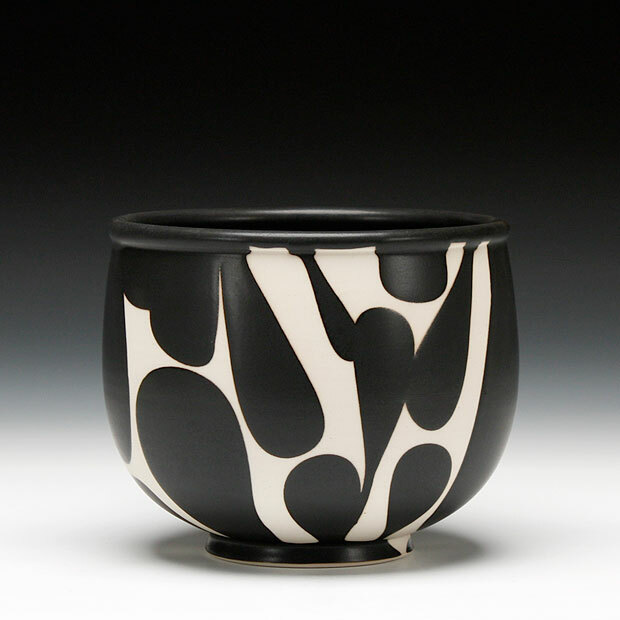 I am also exploring the contrast of the white porcelain surface with a matte black glaze. The development of this glaze has allowed me to explore new forms of decoration on the clay surface. Along with the white/black contrast, I am using a matte/glossy contrast, in techniques of dripping, pouring, and spattering. This new work is vastly different than my traditional approach of brushwork on the white glossy surface. As a potter, clay directs and influences my lifestyle. Subsequently, the synthesis of clay, artist, and individual is my philosophical approach.